Marine Capital (MCLShipping) tweets are identified by the Marine Capital logo and are intended for persons who are professional clients and eligible counterparties for the purposes of the rules and guidance of the Financial Conduct Authority. Personal account information or personal financial information must never be disclosed in tweets or direct messages to MCLShipping. Refer to Twitter privacy and security policies. 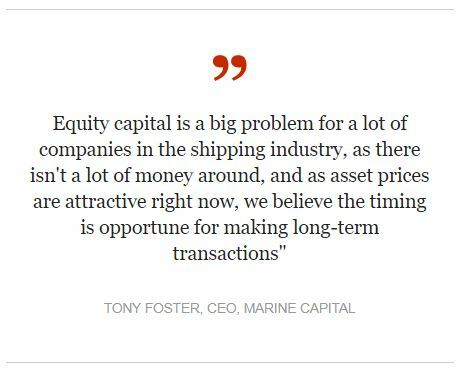 For questions about Marine Capital funds and client services please contact Marine Capital directly or visit our website at www.marine-capital.co.uk. Marine Capital Limited is not affiliated with Twitter Inc. and holds no responsibility for the operations and services or security and privacy of Twitter Inc. sites or any third party applications that may be connected or linked to by Twitter or its users. Marine Capital does not assume any responsibility or liability with respect to third party websites linked to via our Twitter page and does not endorse any such linked sites. MCLShipping tweets are provided for informational purposes only and should not be construed as investment advice. The opinions and views expressed here are those held by Marine Capital at the time of publication, which are subject to change without notice and do not constitute offers or solicitations to any person in any jurisdiction to enter into or exit from any investment. Marine Capital Limited accepts no legal responsibility or liability for any matter or opinion expressed in this material, issued in the UK by Marine Capital Limited, which is authorised and regulated by the Financial Conduct Authority. Registered office: 3/F Sackville House, 40 Piccadilly, London W1J 0DR.